July 9, 2014 – Glenmorangie is releasing its second single malt in the Pride series with the debut of the Pride 1978 tonight in New York City. The whisky was matured in ex-Bourbon barrels for 18 years before being transferred into French Oak wine barriques from an undisclosed vineyard in the Pouillac region of Bordeaux for the final 14 years of maturation, making it not only the oldest Glenmorangie ever released at 32 years, but also the longest to have been “finished” in a wine cask. “It’s actually more delicate in character and has taken on less of the French Oak in spite of being in the French Oak barriques for longer (than the Pride 1981),” said Glenmorangie Director of Whisky Creation Dr. Bill Lumsden in an interview with WhiskyCast’s Mark Gillespie. “The wine barriques may have been used twice, which is often the case with these top chateaus. The tannins are very soft, they’re very nicely integrated into the whisky, and there’s a lot of characteristic Glenmorangie flavors in there.” He later confirmed that the barriques were used twice before being filled with the whisky. A total of five barriques were used for the Pride 1978, with a sixth that was set aside for use in the release falling victim to a leak that went undiscovered until the casks were removed from the warehouse for bottling. As a result, only 700 one-litre bottles will be available worldwide, with a recommended retail price in the US of $5,800 each. 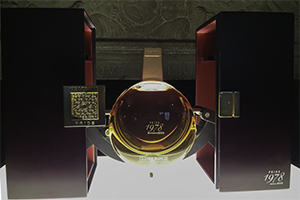 The Pride 1978 was removed from casks and bottled in 2012 at 46.4% ABV, but was not released this year while the distillery collaborated with artist Idris Khan on a multimedia project that will also see a limited-edition Khan print included with each decanter. Tasting notes for the Glenmorangie Pride 1978 will be available soon.